Are we living in a golden age for journalism, or is it the Dark Ages? There’s nothing that gets a group of media types going like that question, which is kind of an updated version of a perennial favorite: “Are bloggers journalists?” Obviously, the kind of upheaval that leads to mass layoffs at papers like the Chicago Sun-Times or the loss of $500 million in ad revenue for the New York Times is nothing to sneeze at. But it’s important to take note of the good things that the web has brought as well — and the best is that journalism has been freed from its confines, and is available to anyone, anywhere, at any time. And that can be very, very powerful. Everyone likes to point out when this state of affairs fails in some way: like when Reddit users identified the wrong man as the Boston bomber in 2013, for example, or when a network of media sites perpetuate obvious hoaxes and misinformation because they care more about clicks than the truth, something Craig Silverman described in detail in his recent report for the Tow Center for Digital Journalism at Columbia University. But I think it’s also worth pointing out when “citizen journalism” — or networked journalism, or whatever we want to call it — really works, and a couple of great examples of that have come to light recently. One of them is related to a project that I’ve written about: namely, the open Ukrainian vehicle tracking database that British investigative blogger Eliot Higgins and his team have been putting together through his Bellingcat website, which tracks the movements of Russian troops and machinery in and around Ukraine. Eliot, as I’ve mentioned before, has no formal journalistic training and no background in media whatsoever. But starting from his flat in Leicester, England in 2011 — where he blogged under the nom de plume Brown Moses — he became an expert in Syrian weaponry and terrorist activity by studying YouTube videos and networking with other self-taught experts. His research was cited by New York Times writer C.J. Chivers, and helped confirm that the Syrian government was using banned weapons. In a similar way, the open database of vehicle sightings in Ukraine that Eliot and his team at the Bellingcat site have been putting together — using photos and videos and eyewitness reports of vehicles, blast craters and burn marks that have been posted by residents — has produced some fairly strong evidence that Russia has been firing missiles and other weaponry into Ukraine from inside Russian territory, despite repeated government denials. The second example comes via a piece in the New York Times magazine, which will be published in print this weekend but is already available online. It tells the story of a group of residents who live in one of the worst slums in Rio de Janeiro — a group that calls itself “Papo Reto,” meaning “straight talk.” Armed only with cellphones, they have been documenting police violence in the Rio favela, at great personal cost, because the Brazilian media apparently isn’t interested. In both of these cases, there is a key reason why amateur journalism is required: in Ukraine, it is difficult for media outlets to devote the kind of resources that would be required to document every sighting of every Russian vehicle, or spend weeks analyzing different types of missile, or the blast marks that they leave when they are fired from a truck. Crowdsourcing of the kind Bellingcat does isn’t just a nice addition to existing coverage, it adds a crucial missing element. 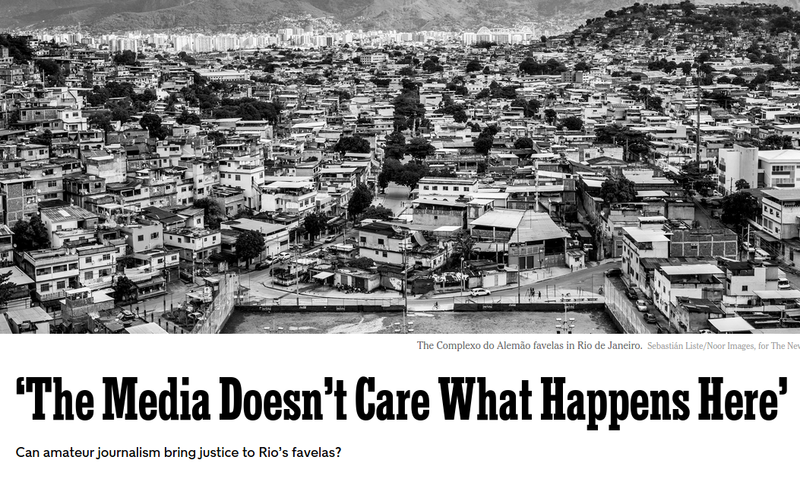 In the case of the Rio favela, the existing media doesn’t seem interested if a few people happen to die suspiciously, since that happens all the time — but it is of extreme interest to the residents of the Complexo do Alemão slum, and also to human-rights groups like Witness, which is trying to help more “citizen journalists” document that kind of behavior in similar situations. In a similar way, Twitter and other forms of social media have become crucial pathways for information in countries like Turkey, where most of the traditional media are either uninterested in the activities of the government or censor themselves because they don’t want to rock the boat. Twitter has become so important that Turkey has tried to ban it, and has pressured the company to block content — including the account of an alternative newspaper (to its credit, Twitter refused). Are there flaws in citizen journalism? Of course there are. Is there a downside to giving everyone a video camera and a Twitter account and telling them to become reporters? Definitely. But there is also a massive upside to doing so, and examples like Bellingcat and Papo Reto in Rio de Janeiro make that point better than I ever could. Great reading thanks! But why can’t I “favorite” it?